With our experience accumulated over more than 30 years, we can provide you with just the right equipment to satisfy your requirements. 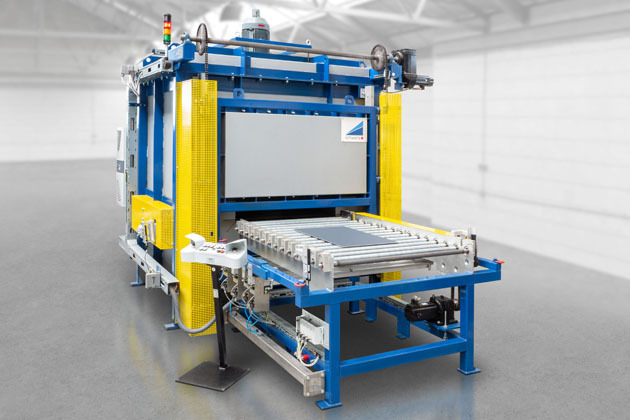 Our systems are capable of heat-treating all aluminum components used in automotive or aircraft manufacturing and in the building construction industry. The product portfolio comprises chamber furnaces, pit furnaces, continuous furnaces, elevator furnaces, roller-hearth furnaces and vertical furnace systems. Whether you need to process rolled products, extrusions, forgings or castings – we will build the right solution for you. The jet heating principle provides efficient heating by high convection via recirculation of air, flue gas or protective atmosphere. 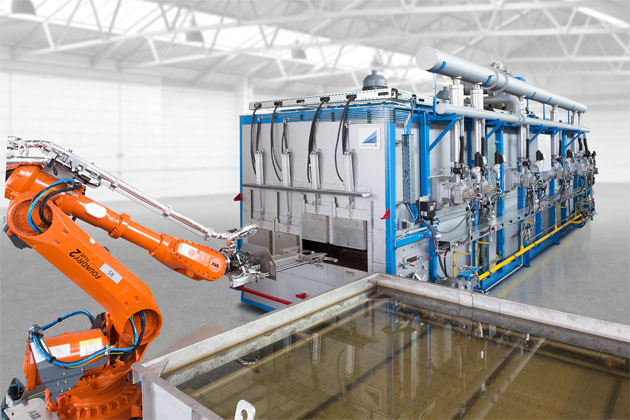 The gases are uniformly applied to the aluminum parts at high velocity by an array of nozzles adapted to the product. As a result, a maximum heat transfer coefficient is achieved and the heat-up time is minimized accordingly. Where parts vary in height and geometry, a nozzle array with motorized adjustment can be used to set the ideal nozzle-to-product distance. The equipment can be designed for heating aluminum parts to forging temperature or for direct solution annealing with an appropriate holding zone. Jet rotation heating combines jet heating with a rotation of the nozzle bank. 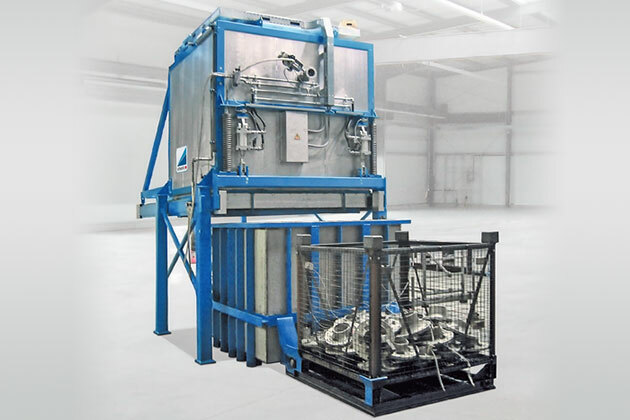 We have developed this patented system to achieve uniform heating of aluminum coils. The tubular nozzle array heats up the coil uniformly and with an optimum heat transfer, by perpendicular impact jets. Automatic width adjustment of the tubular nozzle bank ensures short heat-up times even if coil widths vary. The rotary heat transfer to the coil surface prevents surface marking from occurring at homogenisation temperatures. This design is suitable for single-coil furnaces or, coil size permitting, for twin-coil units. The furnace system is designed to operate under protective atmosphere. 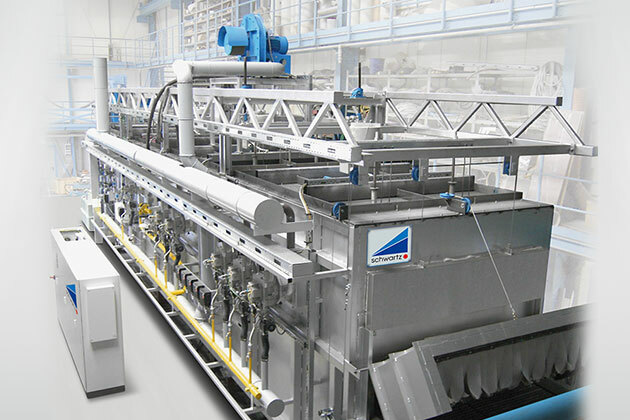 It features a protective-gas to water heat exchanger for the cooling stage in which a uniform reduction of the product temperature is achieved. Thin-strip coils are placed in the furnace on their spools, while heavier-gauge coils are held on prisms or wells. The coils are loaded into the furnace by a traversing charging machine with lifting arms. Our chamber furnaces serve to heat aluminum products of any geometry, from bulk parts in transport containers, through ingots or bolts, to aluminum components arranged on trays. The product is heated by powerful recirculation of hot air or flue gas driven by fans so as to ensure a uniform heat transfer. The atmosphere flow is controlled individually to match the product arrangement in the furnace or on the trays. Chamber furnaces are loaded by means of a bogie or by placing the loads on trays. 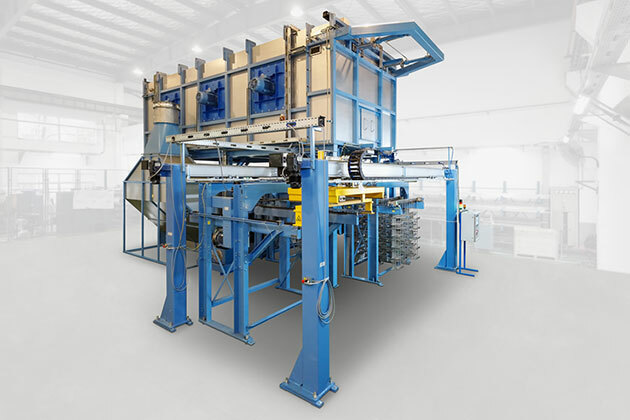 In our roller-hearth furnace for solution-annealing aluminum rods and sections, the load moves horizontally on a roller conveyor into the heating chamber. 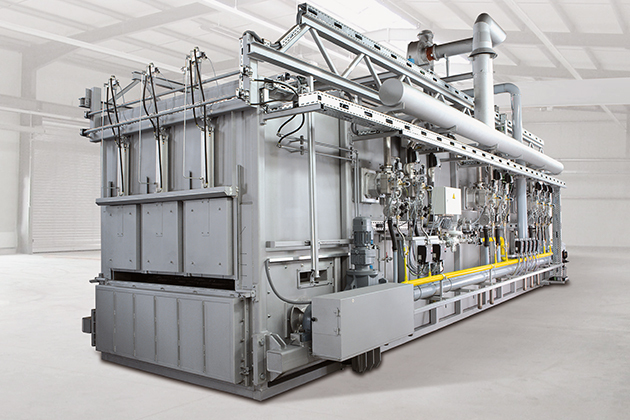 The heat treatment is carried out by high convection with the load resting on a reversible roller track. Upon completion of the annealing process, the product is advanced quickly into the adjoining high-pressure and low-pressure water quench and finally dried. A space-saving alternative to the chamber furnace is schwartz’s elevator furnace system. In this furnace, the load containing aluminum parts is raised into the furnace from below by a lifting device and then locked in position. Once the furnace floor is closed, the heat treatment is started with gas or electrical heating. 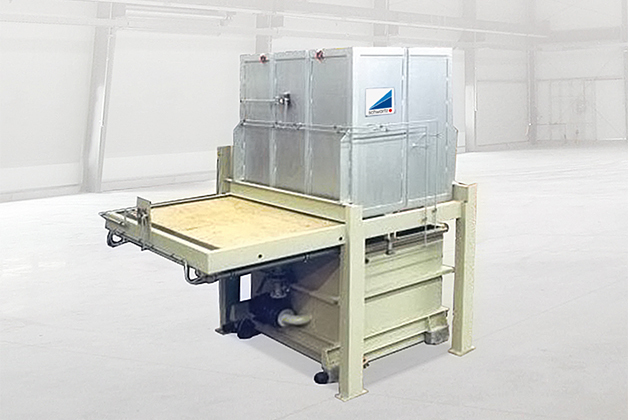 A quench tank mounted on a mobile floor carriage can be moved under the furnace upon completion of the heat treatment. 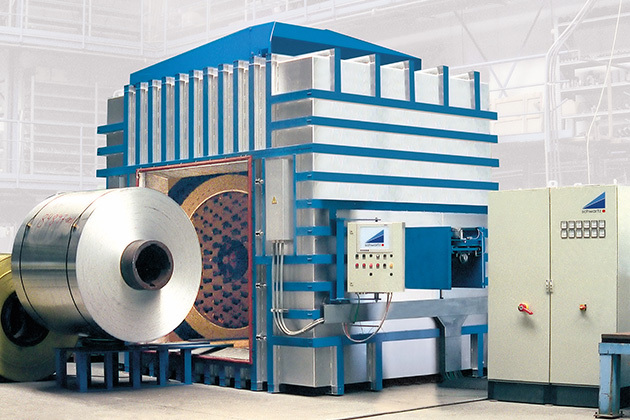 For semi-hot and hot forming of aluminum sheets we offer you our patented application with high convection Jet Heating that has been successfully tested in our in-house Technology Center. 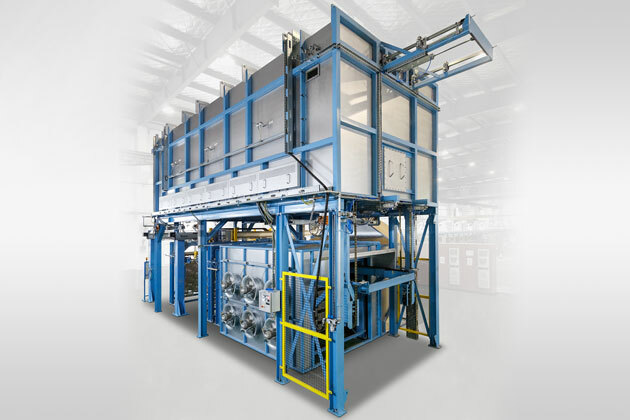 This innovative furnace system can be used together with our radiation-heated furnace for steel sheets upstream of a press as a twin or duplex system to treat either aluminum or steel.